I shot 69 and lost by 14 shots… nope not at Putt Putt! A mini-tour player by the name Rhein Gibson did something last week that could be the greatest accomplishment in the history of the game. He went out with a couple of buddies to play a round at River Oaks Golf Club in Oklahoma, a course he would frequent during his time at Oklahoma Christian University, and shot a 16-under round of 55, a number that is said to have at least tied, if not beaten, the lowest round ever recorded in golf history. The scorecard, courtesy of Reddit, is above and the club confirmed that the score is legit and the card is framed on the wall. Just take a good, long minute and stare at that thing and be amazed. That is one guy … making 12 birdies … and two eagles. Normally when a good player has only four pars in one round, he’s infuriated, but I guess when the other 14 holes are either circles or triangles, things are going your way. Gibson isn’t just some slouch (obviously). The 26-year-old Aussie is currently playing on the Golfweek National Pro Tour, and through six events is 12th on the money list. So enjoy that incredible score, and just soak in the fact that this man didn’t just beat your best four-man scramble score ever, he obliterated it. Holy cow batman, that is one heck of a score, and looks like it should be the lowest score in the history of golf. When I first heard about this amazing feat, I thought of a guy playing a really short course and tearing it up. One of those rounds that you can do no wrong and post the best score of your abilities. We all have a favorite course, one that really sets up to our game. The par 5’s are submissive (and all reachable in two), the par 3’s have the right look for our games, and the par 4’s are well flat out birdie holes. I know my favorite course growing up was a place in Naperville called Country Lakes. It was short par 73 course (all five par 5’s were reachable) and my current low round is still from “The Lakes”. (My lowest round is a 5 under 68, but my favorite round is a 4 under 69 because I birdied the last four to shoot 69). I have shot under par at the Lakes a dozen times and I know I can birdie or eagle every hole on the golf course (more birdies than eagles, but you know what I mean). The Lakes is what I thought of when I first heard this feat. I know that someone of a tour player quality could go out and shoot in the 50’s there, because there are some drivable par 4’s, you can make eagle on the par 5’s, and if everything goes correctly fire a really low round. So I figure this is what Gibson did. 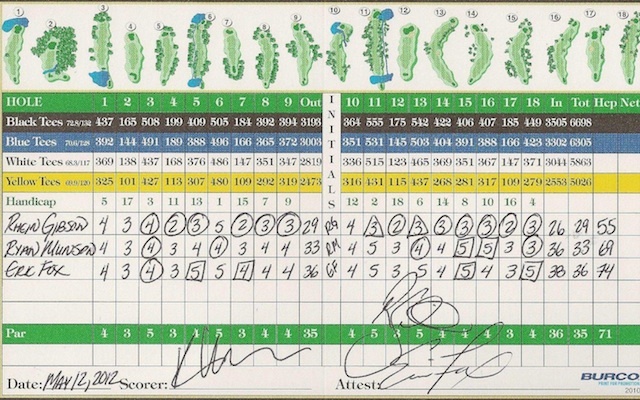 Went to his home course that he knows and loves, and shot the best round in history. But check the scorecard on the back nine, there is only one par four under 400 yards from the black tee box, and both par 5’s are in the 540 range. In fact the only short hole on the back nine is the 10th, which Gibson made a par on. Even if this 55 is not the lowest round in the history of golf, it is still one of the most amazing. Congratulations on a golf feat that touring pros only dream of, and 99% of them have never broken 60 (even on their home courses). A 55 is more than a score, it is something that defines you as a player and a person.